I am Steven T Mnuchin, Secretary of the Treasury under the U.S. Department of the Treasury. You can get more details about me here;and attached is my identity card for confirmation of office. At the recently concluded meeting with the World Bank and the United Nations, an agreement was reached between both parties for us to settle all outstanding payments accrued to individuals/corporations with respect to local and overseas contract payment, debt re-scheduling and outstanding compensation payment. Fortunately, you have been selected alongside a few other beneficiaries to receive your own payment of $1.5million (One Million five hundred thousand United States Dollars only). We have been notified that you are yet to receive your fund valued at $1.5million This money will now be transferred to your nominated bank account that is of the confirmation is true that you are yet to recieve your funds. I am Mr Steven T Mnuchin, Secretary of the Treasury under the U.S. Department of the Treasury. You can get more details about me here;and attached is my identity card for confirmation of office. Thank you for your email of acknowledgement as I hope these email gets to you in a good health condition and a good frame of mind. With the content of your email I understood that you are yet to recieve your funds and I will proceed to ensure you get your funds. Again These funds is as a result of unsettled funds, Lottery , Debt and due compensation funds as approved by the United Nation. For the legitimacy of these transaction, all legal document/paper work will be in your information to confirm you as the sole beneficiary of these funds to satisfy legal requirement. The United Nation has cleared up the fee to the procurement of these document all you need to do is to provide me with details as below so the document will be made in your name and after that your funds should and will be transferred to your designate bank account. Good Day dear and how are you doing today together with your family? I hope these email gets to you in a good health Condition.I write to inform you that the Department Of Treasury has screened and confirmed your personal details thus approving you to be the sole beneficiary of the sum of $1.5million. Please download the Attached to view and confirm your approval document, at the note I will say a Big Congratulations to you. Thanks as i wait to hear from you thus the required information to proceed with your funds transfer. Thank you for your email thus provision of your designate account details where your funds should be transferred. I write to inform you of a successful funds transfer into your Bank account.The sum of $1.5million has been successfully transferred into your account and I have attached the wire/Transfer slip to you for confirmation of funds transfer. Your funds will hit your account within in 24hours to 48hours. Please do confirm the receipt of these email and acknowledgement of transfer slip. Thanks and waiting for your email acknowledgement and also your words to inform me when funds has reflected in your bank account. How are you doing today together with your family? I write to inform you that I got a notification from the Bank Of America (BOA) in regards of your already funds transfer ($1.5million), I was informed that the transfer was a success and funds set to hit your account. 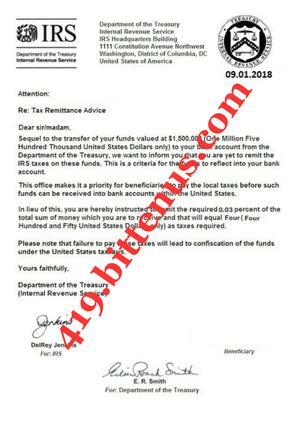 According to the Bank the Internal Revenue Service(IRS) has put a stop on the reflection of your funds demanding for the 0.03 percent of your total funds ($1.5million) which is $450 IRS/Tax Requirement. The Internal Revenue Service (IRS) has issued a Tax requirement document for these confirmation of these information Please download attached and read carefully. In the supposed document, you will find a space where you will sign as the beneficiary at the right hand side of the document.